Prime Minister Recep Tayyip Erdogan is to return to Turkey from a foreign tour as mass protests against his government’s policies continue. Demonstrators have been rallying in Istanbul, Ankara and other cities for a week, with many calling for the three-term prime minister to quit. A police officer died on Thursday after falling off a bridge in Adana province the previous day, reports said. Three other people have been killed and thousands injured in the unrest. Mr Erdogan has called the protests undemocratic but his deputy apologised for police violence and met representatives of the protesters from Istanbul’s Taksim Square. In the Black Sea port of Rize, a large crowd of government supporters attacked a smaller group of young people who were holding a protest on Wednesday. Police had to step in to protect them. It appears to be the first clash between rival groups since the unrest began. Before leaving for his tour of North Africa on Monday, Mr Erdogan had predicted the protests would be over by the time he returned. But on the eve of his return, police in the capital Ankara used tear gas and water cannon on protesters who had erected barricades and set them on fire. Rioting was also reported in the city of Tunceli. The deputy leader of Mr Erdogan’s Justice and Development Party (AKP), Huseyin Celik, went on TV to urge supporters not to flock to the airport to welcome Mr Erdogan back. “The prime minister does not need a show of power,” he said. Protest representatives who met Deputy Prime Minister Bulent Arinc on Wednesday presented demand which included the dismissal of police chiefs, a ban on the use of tear gas, the release of detained protesters, the sacking of Istanbul’s governor, and the scrapping of the plans for the redevelopment of Gezi Park. The plan to redevelop the park, which is part of Taksim Square, is the issue that sparked the protests. “The powers-that-be continue to counter with violence, pressure and prohibitionist policies… demands which are being expressed in a peaceful and democratic manner,” a spokesman for the activists said after the meeting. 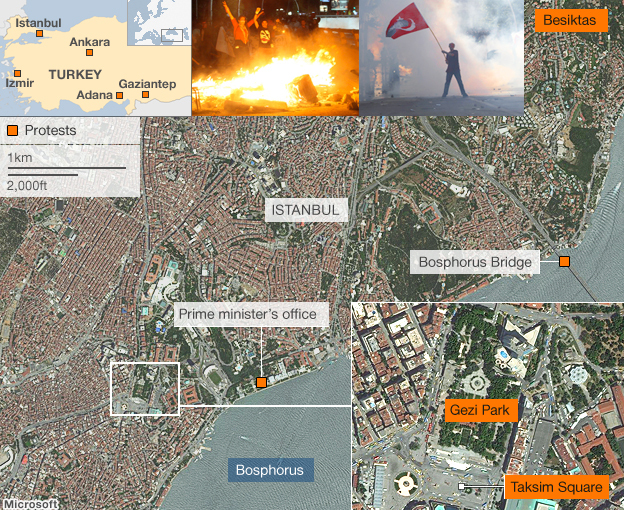 The protests continued into the night but no violence was reported in Istanbul. In a gesture that correspondents said showed solidarity between different groups of protesters, secularist demonstrators in Taksim Square joined devout Muslims for prayers on a traditional Turkish feast day on Wednesday. “Oh great Lord, heed the calls of the demonstrators who have been resisting in this square,” an imam proclaimed. Many demonstrators, who oppose the policies of Mr Erdogan’s Islamist-rooted party, refrained from drinking alcohol in respect of religious sensitivities. It was confirmed on Wednesday that a third person had died as a result of the unrest. Ethem Sarisuluk, 26, was wounded in the head during clashes in Ankara, the Turkish Medical Association told reporters. 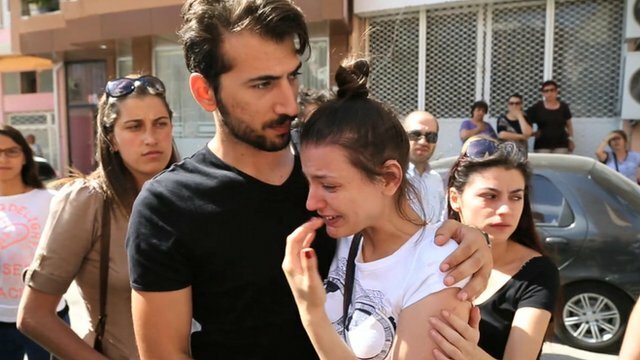 Abdullah Comert, 22, received a fatal head wound in the southern city of Antakya on Monday while Mehmet Ayvalitas, 20, was hit and killed by a car in Istanbul on Sunday. Initial reports had said Mr Comert was killed by a bullet but this was corrected after a post-mortem examination. Then on Thursday, the Hurriyet newspaper reported that a police commissioner had died in hospital of his injuries after falling off a bridge while chasing protesters in Adana province on Wednesday. In the coastal city of Izmir, protesters demanded the release of about 30 people arrested for posting “misinformation” on Twitter. Relatives said those detained – young men and women, mostly in their early 20s – had posted as few as two tweets informing protesters of the location of police activity and roadblocks in the city. They feared they would be charged with criminal incitement. The prime minister has called the micro-blogging site a “menace” used to spread “lies”. 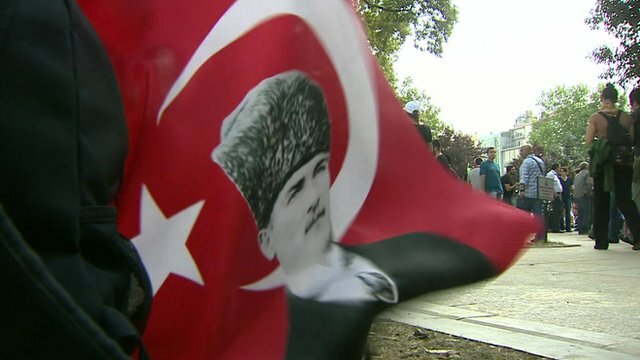 Demonstrators accuse Mr Erdogan’s government of becoming increasingly authoritarian and trying to impose conservative Islamic values on a secular state. Mr Erdogan has said the demonstrations are organised by “extremists”. The AKP has governed Turkey since 2002, winning a series of election victories. Are you in Turkey? Have you been protesting? What do you think about the current situation? Please get in touch using the form below.